Do you have a message you want to share, but imposter syndrome is preventing you from sharing it? Julie Broad wants to inspire you to write a book to make your message stand out! She shares why writing a book is one of the best ways to share your message, even if you don’t consider yourself an expert! 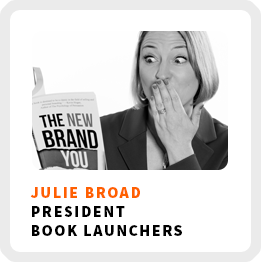 Her company, Book Launchers, helps entrepreneurs write, self-publish, and sell books to help boost their business. Why writing a book can be a great way to stand out, but may not be for everyone. Sharing your journey as your learn and experiment. Building a successful business from a small client base. Creating teachable hooks in your business. Pros and cons of self-publishing versus using a publishing company. Core work activities + habits: 1) Marketing and sales through things like podcast interviews to build awareness. 2) Talking to potential clients. 3) Managing the team and ensuring they’re serving the clients. Ideal work environment: In a co-working space with people all around, but in an office to herself, and being able to drive her own schedule. Regains focus by: Going back to her weekly and daily plans. 90-day goal: Keep attracting new clients to build awareness and continuing to grow her team. 1) Figure out why you want to write a book and what is driving that desire. 2) Identify your ideal reader and what they are going to get from the book.